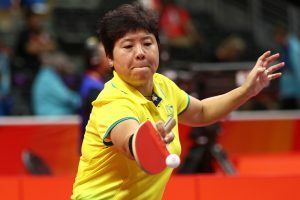 Team Australia kicked off their 2018 Gold Coast Commonwealth Games campaign in style this morning with a 3-0 win over Mauritius in the Women’s Team Event. The no.3 seeds were safe in the experienced hands of Jian Fang Lay. Lay was on her toes from the get go and looking to dominate the match with big looping forehands. A 3-0 win was quickly put on the board. Tracy Feng was next up to the plate on her Commonwealth Games debut. The nerves were clearly visible but she was never in doubt and posted a straight games win. Feng was quickly back on to the court straight after for the doubles match to partner up with Melissa Tapper. Once again it was a non nonsense match, with the Aussies cruising to a straight games win. Team coach Miao Miao was pleased with her team’s performance. With a 3-0 win against Mauritius, Australia will now turn their attention to the afternoon match against Canada.